Here you can book your holidays apartment in Italy. With our offers you will find various type of homes and apartments and we are certain to please your dreams assuring the right and comfortable needs during your stay. 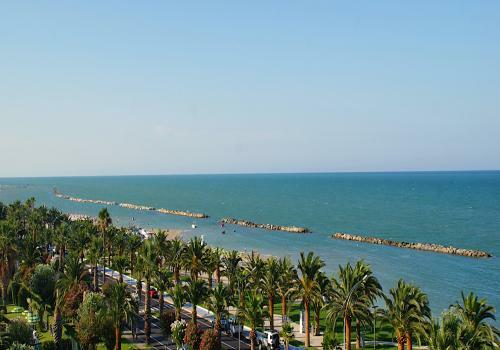 Our immense choice of apartments, villas and Bed & breakfast of many cities in the Marche and Abruzzi is included San Benedetto del Tronto, the famous city of the Palm Riviera and surrounded by towns such as Martinsicuro, Colonnella, Villarosa, Alba Adriatica, Tortoreto Lido, Grottammare, and Cupramarittima. The Riviera of the palms is wonderful, beautiful promenade, every evening there are parties with dancing to beach resorts or hotels, you eat from God, and the Marches are wonderful and welcoming people, they are twenty years that I go on holiday it , and sometimes I also went around Easter, it is very well and is full of people! " "In San Benedetto del Tronto, there are more than 7,000 palm trees that seem to embrace the air, the people who are walking, the birds that flutter. These large trees are interspersed with oleanders on scented avenues by lovely floral and marine fragrances. Even the smell of the food reaches the senses. This city is a unique reality in Europe "
"It 's called the Riviera because it has the seafront about 5 km is bordered by tall palm trees as well as the rest of the city. There is the" Mastodon arboreal "with a circumference of nearly 5 meters at the base, the largest palm the world. the waterfront has a beautiful promenade with thematic gardens that line the beach (wet garden with a pond, the Mediterranean garden, he citrus, arid oasis with streams and palm trees, children's garden, etc.). the bike path connects two other towns Riparian Groton and Cupra. the golden beach of fine sand is ideal for walking, play, run and entertain the kids. the water is shallow with rocks reachable by swimming from the coast. " "In summer, many activities are offered by the Blue Card and also by Ente for free: theatrical talent shows, music at the Palazzina Azzurra, children's activities, pictorial exhibitions. In the center beautiful pine forests equipped with benches, Japanese garden, play areas, sports facilities (tennis courts, ice rink, hockey, cycling, athletics track, swimming pools), romantic walk to the pier and the market turistico.In port area for some years are planned nightly talent shows and special gastronomic events. " "There are numerous festivals evening even in medieval neighboring countries reached in a very short time. Ascoli Piceno provincial capital deserves a historic visit (about 20 minutes with no toll highway) .. because very interesting and important." "Sociable Marche People, Excellent food from traditional and authentic flavors. The hills a short distance offering excellent wine and organic oil. The only drawback: a few connections with trains, planes, buses. In summer there are evening shuttles to tourists: the ideal is to turn into cycling because in the evening it is almost impossible to park on the waterfront. Presence of numerous hotels and residences: short-range kilometer coast. 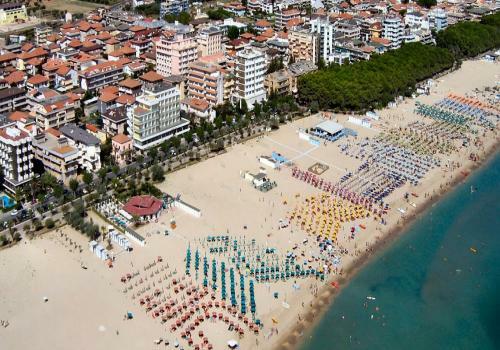 San Benedetto is little known but absolutely to be recommended especially for families with children! ". The place looks like a modern seaside resort, commercial and tourist, but with a focus on green and nature, as evidenced by the way the presence of two biotopes in Martinsicuro and Villa Rosa. It is one of the first examples of dune atmosphere reconstitution in Abruzzo. To all this, in the summer plus the many local festivals, lovingly landscaped and weekly markets where you will find all sorts of regional delicacies. Small restaurants, Pubs and Farms enchant with their excellent, mostly peasant cuisine, where they are used mainly local produce. 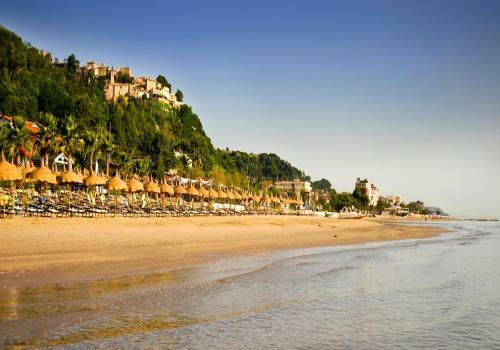 "Lively seaside town, very pretty and quiet, clean with equipped beaches and crystal clear sea. Very characteristic promenade with many palm trees, hotels for all budgets and chalets, where to eat, drink a coffee or an aperitif, with affordable prices. It is also advisable to visit the characteristic ancient village, which can be reached by car or by a train specially designed for tourists." "It is a beautiful city of 15,000 inhabitants. It overlooks the Adriatic Sea. It has a wonderful sandy beach and not pebbles. It has been a blue flag for many years. 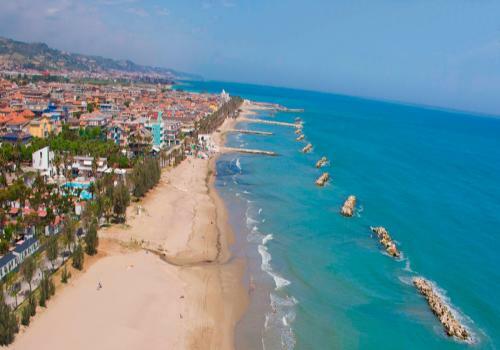 It has a cycle path that runs along the sea well over 15 km long..."
"Grottammare is practically attached to San Benedetto del Tronto, which on the contrary is a much more chaotic seaside resort. You eat very well, especially in the month of August every evening you find a festival in the neighborhood! About the surroundings, there are a myriad of medieval villages close to the sea, all very beautiful, and about 50 km from Grottammare moving inland immediately find the mountain, with the Sibillini mountains. Particular attention goes to the ancient and high part of Grottammare, unique in its beauty and tranquility, where you just have to look up on the Adriatic to remain enchanted and get lost in its majesty. 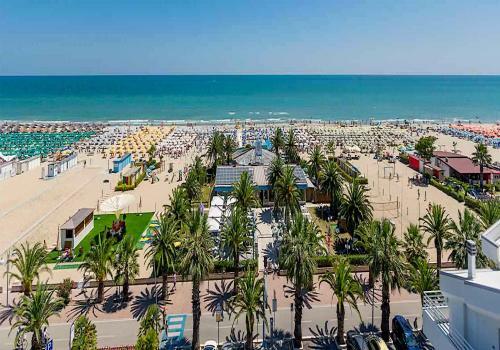 But if you are looking for sea and entertainment intended as discos and clubs, I suggest you focus on Alba Adriatica (which is already Abruzzo but is a few tens of kilometers from Grottammare). The rimini of the mid / low Adriatic. "Beautiful city with a beautiful bike path and a wide and sandy beach, clean and very wide sea as there are no rocks in front of it. Ideal for family tourism even for children as it is shallow. Seafront with attention to detail with lots of greenery, pine forests and areas equipped with games"
"A town that with a beautiful seafront, full of equipment and with bathing establishments that are not spared with musical activities and events, also offers a historical part in the hills very interesting and sugestive to visit ....."
"Very cozy evening promenade for walking especially with many locals to entertain. Several pubs, great food, almost all hotels with animation. Wide enough even stony beach shoreline. Convenient exit from a few kilometers." "The town is well maintained and has a great program of events for all ages. Do not you get bored! Its pine forest adjacent to the beach and beautiful and also inland there are beautiful places to visit and to enjoy clean sea beaches to size of families and locals very friendly very nice promenade ideal for walking and in the evening there are always some nice markets "
"Period beginning of August, we were only 3 days but were very nice, friendly shopkeepers, average prices, there is still much the concept of" doorstep shop ", the busy streets but of course, the evening is a bit chaotic type Rimini but if you go to the sea is what you need. The board and I think I will be back. " "It remained in my heart. After having stayed there two years ago, I decided to come back again this year. Cupra is such a small town, in the province of Ascoli Piceno, in the Marche. The village is composed of Cupra Marina and Cupra which rises above a hill. I spent my short vacation in Cupra Marittima and every morning I satiated by the sparkle of the sea. The seafront is dotted with hotels and little houses. The beach is sandy and the sea slowly degrades, just as I like it. You can get to Grottammare, or even to San Benedetto del Tronto, on foot, walking on the water's edge with the water that gently tickles the ankles. Or you can get there by taking a nice bike path built near the beach." 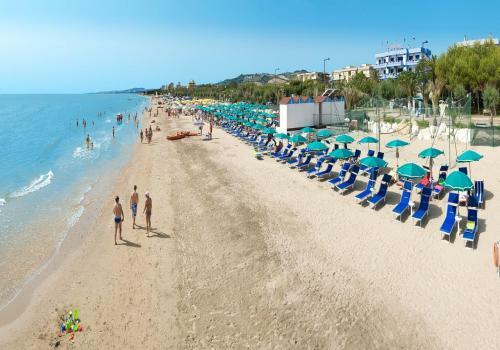 "It offers spacious beaches where there are often bowls tournaments, clean sea and a particular promenade, embellished with well-kept palm trees, tall pines, colorful oleanders, perfect flower beds and perfumed bougainvillea. We often take long walks on foot or by bike. And yes, by bike it's great because there are some very comfortable and suggestive cycle paths along the sea, which are miles long. In addition, Cupra offers excellent hotel facilities, many campsites, tourist villages, sports facilities of all kinds, pubs, open-air discotheques, pine forests with games for children, cottages and typical restaurants. You can not leave these areas without tasting the Ascolan olives, ciauscolo and Campofilone macaroni. Fresh fish is in abundance and often on the promenade early in the morning there are fishermen who have just come back with their boats that sell it for just a few euros." "For more than 10 years, to be precise 14, Cupra Marittima is awarded with a recognition that makes it special: the '' European Blue Flag ''. It is conferred by the FEE (Foundation for Environmental Education) and is the guarantee of a sea and clean beaches."